(Our Dumbbells Guide Price €3 – €5 per KG) Gym Equipment Ireland Supply The finest quality dumbbells available in the marketplace,our research shows 6 leading suppliers of commercial dumbbells Worldwide, here is a great brand to check out, 10kg – 50kg (17 pairs), 2″ Thick Ultra Smooth Revolving, Deep Knurled Handles with Dual Roller Bearings,0.5kg Increments giving effectively 81 Pairs of Dumbbells!! 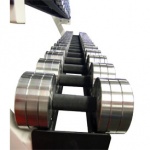 Magnetic ‘Add On’ weights for 0.5kg Increases,2 Tier Dumbbell Rack to hold the complete set. Training with Thick Bars is now accepted as one of the best ways to further increase strength while massively reducing injuries. One of the highest regarded coaches Charles Poliquin uses 2″ bars/handles almost exclusively and has trained many World Class Athletes in the same way.